Once a dominant force in the smartphone industry, BlackBerry has lost its way in recent years, and having fallen way behind the Apple iPhone in the pecking order, the Canadian outfit has called out its Cupertino rival in the battle of the IM services. Having opened BBM up to iOS, Android and Windows Phone recently, the company is now busy trying to sell the once-popular instant-messaging service to the masses, and as is the case with most tech companies nowadays, BlackBerry has gone on the offensive against its fierce rival’s corresponding iMessage. Since launch, iMessage has had its fair share of teething issues. Spammers have had a field day in targeting users, and downtime has constantly plagued the service. But things have improved, and for speed and security, it’s among the best in the business. BlackBerry Messenger has long since been lauded as the strongest of the IM services, but with the company behind it having dropped off the map as far as the smartphone industry is concerned, BBM has also suffered the effects. 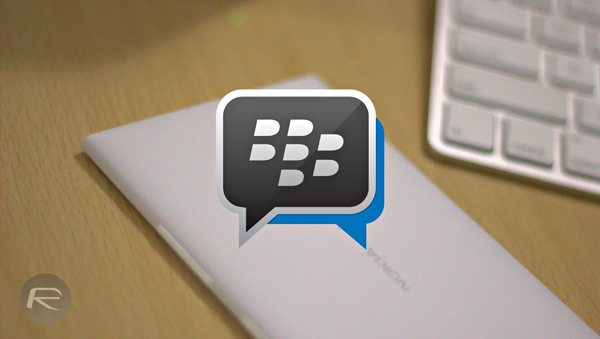 The decision to expand to iOS and Android was seen as a wise, albeit belated move, and with its multi-platform status now official, the onus is on BlackBerry to topple its competitors, and as well as noting of BBM’s anti-spam features– an area in which iMessage is glaringly bereft, the company also talks about how users can actively block unsolicited messages. The final point made, ironically, is that iMessage “is only available on Apple products“, something that has already bitten BlackBerry on the rear as we all know. It seems less than likely that Apple will follow suit and open up to different platforms any time soon, but of everything outlined, the fact that iMessage is an Apple-only enterprise is certainly holding the iPhone maker back. The problem BlackBerry has here is not that its points aren’t valid – by and large, the assessment is fair – but that folks tend only to migrate to services also adopted by their friends and acquaintances. For example, I use WhatsApp for the purpose of conversing with almost everyone, and while it has its issues – the inability to send full-size images and videos being one — I’m not going to seek alternatives unless those I talk to are doing the same. Thus, despite its previous popularity, BBM has a real job on its hands catching WhatsApp, iMessage, or any other thriving service. iMessage may be a bit of a spam magnet, but given that it runs natively on iOS and OS X these days, it’s unlikely that those using it now will cease to do so. What do you think of BlackBerry’s strategy? Would you ditch your current IM app for BBM? Do share your thoughts below. 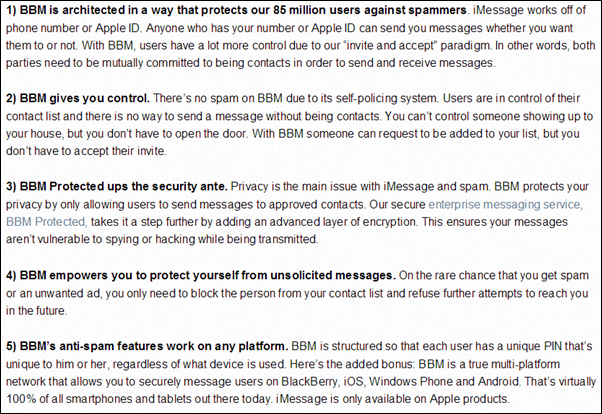 well said BBM, but iOS 8 iMessage is simple and best with enrich new features. They just repeated the same point 4 times smh. I have both BBM and iMessage and I use whatsapp more often not because it is the best of all, I use it because all my contacts have it. For iMessage whoever has your number or ID can be blocked for messaging you, and all your chat history can be restored back after new update that is not the case for BBM doing a new update your chat history is gone and there’s no cloud service for BIS, Apple is the best in lass for services and covering your back. I have said for a long time that there is an easy way for BBM, or WhatsApp, or iMessage, or whatever-named-message, service can do to not only STAND out in the crowd, but that can also lure and keep almost all users. However, I do not think this will ever happen, sadly. It will take 1, just 1 message service to stand up and show that they actually care about their users more than corporate dollars, more than police agencies, more than spy agencies (als NSA thank you Edward Snowden). I do not care what the name of the company of the message service is, who makes it. Listen to many comments made by EFF (Electronic Frontier Foundation), and Edward Snowden. Make the software, i.e. App, 100% Free and 100% open-source (so if any malicious changes are made by anyone, any company, or any agency, the changes can be easily detected, called out, and the public can be made aware of. Provide the ability to send all SMS/MMS messages over Tor, encrypted using OTR (Off the Record encryption), using 100% perfect forward secrecy, secured HTTPS/Hardened SSL connections, that randomizes all of a user’s location (unless that user directly chooses and decides to share their location with a contact they are communicating with. Block man-in-the-middle man-on-the-side attacks. If you choose to provide “cloud” storage services with it, make 100% of all user data (including users metadata), encrypted to prevent any employee, any member of any law enforcement agency, or hacker, have 0% possible chance or opportunity to see and access user’s data (including being court ordered to provide it). i.e. STOP allowing places like the NSA to make you release software (apps) with crippled security and privacy, to make it easy for anyone to access your communications or user meta data from those conversations. TRUST ME, if any company, no matter who it is, ACTUALLY provides non-crippled, secured, private, encrypted SMS/MMS messaging, that actually shows they really do stand for us, the users (i.e your potential and existing customers), show us you care for us more than any police agency, spy agency, or corporate dollars. SHOW US you care for us, stand by us and for us, and you will get an army of millions of users for life. Here is the reason why BBM is not better than iMessage. It’s not the default option on iPhones. Period, end of story. If RIM was so smart they wouldn’t have gone out of business. Hope it changes with the new iMessage.